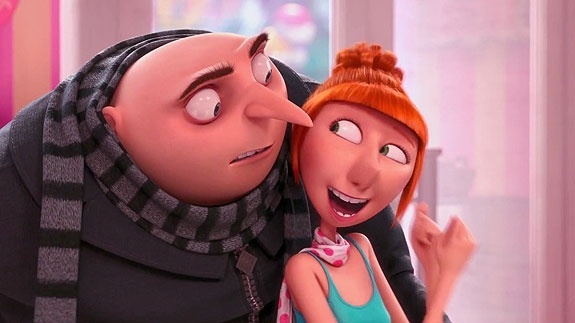 Despicable Me 2 vs. The Lone Ranger? Two movies opened up on the same day The Lone Ranger and Despicable Me 2, one made from Disney and the other Universal Studios, two very opposing entertainment industries. The Lone Ranger is a movie that tells the rising of John Reid, played by Armie Hammer, Reid is a stickler for the law coming to Texas to visit his older brother, Dan Reid. John doesn’t know that the train is carrying an outlaw who is Butch Cavendish caught by Dan and also the Comanche spirit warrior, Tonto who is played by Johnny Depp. The plot goes on as the railroad is being built but with little care for the Native Americans which are the Comanche, the mayor of the town who is orchestrating the production of the railroads has agreed to keep building the railroads on their side of the river and away from the Comanche land as long as they stay out of the towns and their production, however, the plot thickens when silver and gold minerals come into play—let’s leave it at that. I went with my boyfriend to see the movie and we both agreed it was funny, but then we thought, no not just any funny, it’s definitely “Johnny Depp” funny. I guess his humor has to be put into a separate category. I hate to say it, but, I did see and hear a lot of Captain Jack Sparrow in Tonto. Let me take you to one of the beginning scenes, Tonto and John Reid were both handcuffed together and when they were fighting the bad guys on the train, pure luck something would happen to help them be able to fight off the bad guys. This is just like Captain Jack Sparrow when he fights or takes on the bad guys he doesn’t think about it, it sort of just happens. Another great actor or should I say animal actor that stood out was Silver the white spirit horse. The movie incorporated Silver into situations where you would least expect a horse to appear. I’ve given The Lone Ranger 3 out or 5 Mickeys, it’s a well made movie, and I did like it. I was lucky enough to get to see Despicable Me 2 and I have to admit it was better than the first one. The two movies are difficult to compare with each other. Despicable Me 2 is without a doubt a family movie, not saying The Lone Ranger isn’t, but when someone gets shot in the head while blood splatters around—you just don’t take your two year old there. Both movies had a love interest, but Despicable Me 2 was able to make it funny and entertaining while The Lone Ranger was serious and risky. In the end, I’m definitely a kid at heart and will have to say, I liked Despicable Me 2 over The Lone Ranger, sorry Disney! This entry was posted in Entertainment and tagged 2013, armie hammer, despicable, johnny depp, lone, me, movies, ranger, silver by JNYFAV. Bookmark the permalink. Honestly, I don’t know IF I’ll see Lone Ranger, but Dispicable Me 2 was incredible!!! The last 15 minutes had me laughing louder than my kids! I haven’t seen either, but I think I’m more interested in seeing Despicable Me 2! I have yet to see both of these movies, I need to get on that! Loved Despicable Me 2… I don’t really think the Lone Ranger had much of an appeal this side of the pond. Loads of my friends see a lot of films, but I don’t know anyone who saw it over here in the UK.